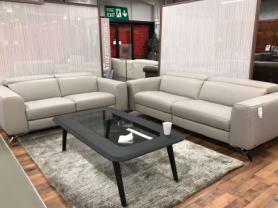 Modern slim and sleek design most popular in the Natuzzi range. Beautiful vibrant Sunflower soft Chenile fabric 3 & 2 Seater sofa. Off the floor model with beautiful brushed chrome feet. Comfort and style all in one, you wont be disappointed with the style and comfort.